Peter Longobardi-Radford protected his unbeaten start to 2017 as GB Taekwondo claimed five medals at the Belgium Open in Lommel. The new gold star in the camp won his latest title moving up to a new weight category and at the expense of GB team mate, Christian McNeish. A week earlier, Longobardi-Radford claimed the Dutch Open crown at -68kg. With one eye on potential World Championship selection, the 22-year-old proved just as unbeatable at -74kg. McNeish from Plaistow won four matches to reach his second final of the year. But it was Longobardi-Radford who completed his nap hand over the German Open runner-up with a 19-7 success. Rachelle Booth, the only female member of the seven-strong squad, produced a welcome return to form fighting at -62kg. The Wigan born, 2015 World Championship silver medallist was a quarter-finalist at the Dutch Open. She started superbly this time and didn’t drop a point in her opening two fights against Germany’s Mihriban Demirkol and Iveta Jirankova of the Czech Republic. Two more wins followed before she came up against Ana Ciuchitu of Moldova in the -62kg final. In a close contest Booth lost 12-4 against the Dutch Open champion. 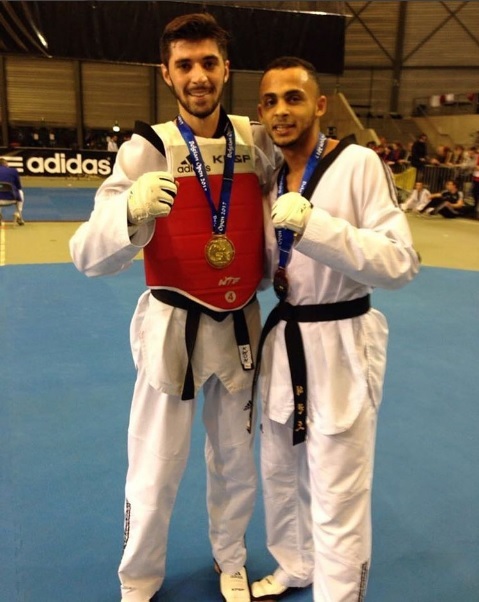 GB Taekwondo’s other medals came from Liverpool’s Josh Calland and Bradly Sinden from Doncaster. Calland picked up bronze at -63kg, losing 15-9 to France’s Dylan Chellamootoo, in the semi-finals while Sinden also finished with bronze at -68kg after losing a semi-final of 38 points against Holland’s Fahd Zaoula. Dutch Open silver medallist, Ben Haines, lost in the first round at -74kg while Max Cater went down 35-15 to Thailand’s Ramnarong Sawekwiharee in his second fight. QF: bt Ruslan Aliev (RUS) 24-4. Round 1: beat Raihau Chin (FRA) 33-12. Round 2: beat Budimir Krivokuca (SRB) 23-15. QF: beat Jack Marton (AUS) 19-8. Final: beat Christian McNeish (GBR) 19-7. Round 2: beat Mohammed Mellouk (NED) 46-26. QF: beat Nicholas Corten (BEL) 15-13. Round 1: beat Clément Martinez (FRA) 25-3. QF: beat Jahmal Kusmus (NED) 31-9.